ALEXANDRIA, Virginia (KTRK) -- Terrifying moments for several members of Congress Wednesday morning after someone opened fire during their baseball practice in Alexandria, Virginia. 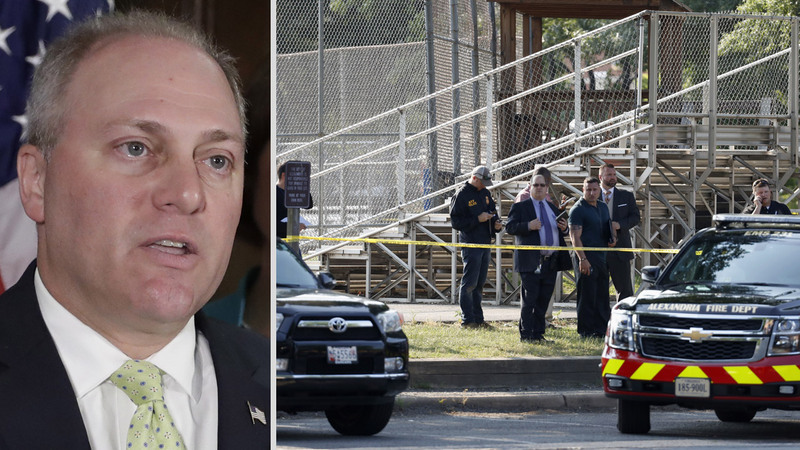 Majority Whip Rep. Steve Scalise was among four people who were shot, one other victim was a staffer and two others were security detail officers. Flake said the shooting happened during batting practice. Scalise was on second base fielding balls. "The gunman was by the third base dugout with a clear view of the field," Flake said. "I just remember seeing gravel bounce off, as shots were coming near us. It was a very loud shot that sounded like a gun then boom, rapid succession after that." Flake said he saw the gunman, now identified as James T. Hodgekinson, with a rifle. This photo of James T. Hodgkinson is from his social media profile. "One staffer was shot. He ran with a wound to the dugout," Flake said. He said Capitol police started firing back behind him, but he wasn't sure if they were with the gunman. "I started yelling back 'Are you friendly? Are you friendly?' We didn't know whether to run our not," Flake said. Flake said he saw the shooter behind the fence and it appeared he still had a line of fire to the dugout. "Joe Barton's boy was here, 10 years old. We got him out of the dugout and stuck him under the bench," he said. Flake said he grabbed Scalise's cellphone and called his wife because he didn't want her waking up and seeing all the news coverage. Texas Representative Joe Barton speaks about his encounter with a shooter during a baseball practice. Rep. Joe Barton is a representative from Texas. He talked about seeing the shooter and protecting his son. "I was getting down protecting, making sure my son was down," Barton said. "The heroes are the police officers who attacked the shooter and in doing so, quite probably, saved many, many lives," Barton said. Rep. Chuck Fleischmann said the annual charity baseball game has been a big part of American history. "This is where Republicans and Democrats come together to raise hundreds of thousands of dollars for charity. This should be a happy and safe place for Americans, on a ball field," Fleischmann said. Fleischmann said they have never had an incident like this. "It makes us fear for our security," he said. "I'm still in a state of shock." "But I was on deck about to hit batting practice on the third base side and I hear, bam. And I look around and behind third base, in the third base dugout, which is a cinderblock, I see a rifle. and I see a little bit of a body," Brooks said. "At the same time I hear Steve Scalise over near second base scream. He was shot. Brooks took off his belt and myself and another congressman applied a tourniquet to try to slow down the bleeding." Brooks told CNN that the gun that he saw was a semi-automatic. He said a security detail shot back at the shooter and that there were at least 50 to 100 shots fired. Brooks said he heard people screaming from the dugout, "Shooter! Shooter! Active shooter!" Hodgkinson was taken into custody after security detail officers fired shots. He later died from his gunshot wounds.